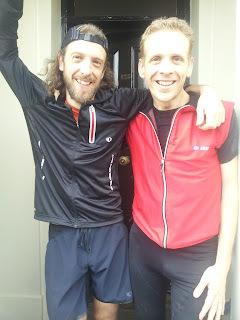 I have titled this post somewhat optimistically; I may never get the chance to go and train with an elite runner ever again, but in this crazy sport you never know. I was continuing in my quest to try and catch up on the past episodes of the wonderful podcast that is Talk Ultra and in one of the first few episodes there was a mention of Nick Clark's blog. For those who don't follow ultra running so keenly, Nick Clark is one of the top 100M trail runners out there. The Anton Krupickas and Geoff Roes of the ultra world are more well-known but at the "big dance" (the Western States 100) there is nobody who has been more consistent in recent years. Anton and Geoff raced spectacularly to 1st and 2nd in 2010, ever immortalised by the outstanding documentary "Unbreakable", with a dehydrated Kilian Jornet behind them in 3rd. Just seconds behind Kilian in 4th (having caught and passed him shortly before the finish, only for Kilian to surge again) was a barely mentioned Nick Clark. Kilian returned to win in 2011, Geoff dropped out, Anton never made the start line and Nick improved to 3rd. Just 3 weeks later he also placed 3rd at the ridiculously tough Hardrock 100. When the course records were shattered in 2012 (Tim Olsen getting the men's, Ellie Greenwood the women's and Dave Mackey the Masters/Veterans), Kilian, Anton and Geoff were not there, but Nick was 3rd again. Add in a win on another grand slam 100M trail race (Wasaach 100 in 2010) and, even without all the other multiple wins and podium placings at significant races, you have one of the greats in the sport today. So, anyway, when I heard mention of Nick's blog, I looked it up and was surprised to see pictures of him racing our nearest Park Run in Whitstable. Although he is based in Colorado, he is actually a Brit who married an American and returns at Christmas to visit his family in Canterbury. A polite email or two later, with reassurances of my running ability and that I wouldn't slow him down too much on a shorter, easy run, he had kindly agreed to run with me the following morning. Needless to say I was as excited as a kid at Christmas! Nick was a great guy and very welcoming. We ran an easy 10M on the trail down to Whitstable and back and from the first few metres I asked a multitude of questions and delighted in hearing all the wisdom he had to share. We talked about the sport, the elite runners, how to train, nutrition, his sponsorship (Pearl Izumi), his racing plans, the future of the sport and my summer ultra plans. It was one of those occasions where time just flies past way too quickly: I was shocked when it was time to turn and head back. I learnt more in that short run than hours of perusing all the available information on the internet would have garnered; such is the way with spending time in the company of an expert who is passionate in his expertise. But more than anything I came away from our brief meeting with great confidence. He assured me of all I was doing right, corrected a couple of things I was about to do not-so-right and spoke confidently of what I might accomplish in my first ultras this coming summer. No doubt I could have picked up most of the information he gave me from a decent book or on the web, but none of that can substitute for the kind of interaction we had on the trail that day. And the spring in my step, the growing optimism and the determination to train to the best of my potential that have developed in the days since are priceless.